As long as people live the way they want and not allow the word of God to be a part of their life everything will seem the same since the very beginning. (2 Peter 3:1-4). It is up to those who see the light out of the darkness, those who see the bigger picture God has placed in the heart of the believer. There is more than this temporary life we live and the unseen can come into view by reading the scriptures of the promises of eternal life by believing on the Son of the Living God! Set your sights on things above for there is your greatest treasure. (Matthew 6:19-21). Lay not up for yourselves treasures upon earth, where moth and rust doth corrupt, and where thieves break through and steal: But lay up for yourselves treasures in heaven, where neither moth nor rust doth corrupt, and where thieves do not break through nor steal: For where your treasure is, there will your heart be also. We have a Saviour who took it upon Himself to suffer on a cross so that we may obtain salvation, He has tasted death for everyone and has gone to prepare a place for us where sorrow, tears and pain will have no place. (Hebrews 2:9-13). But we see Jesus, who was made a little lower than the angels for the suffering of death, crowned with glory and honour; that he by the grace of God should taste death for every man. For it became him, for whom are all things, and by whom are all things, in bringing many sons unto glory, to make the captain of their salvation perfect through sufferings. For both he that sanctifieth and they who are sanctified are all of one: for which cause he is not ashamed to call them brethren, Saying, I will declare thy name unto my brethren, in the midst of the church will I sing praise unto thee. And again, I will put my trust in him. And again, Behold I and the children which God hath given me. It is so easy to get caught up in the now and our every day trials, but if what we live is all there is then there would be no purpose for our life which is why Jesus was forever teaching of the kingdom He would one day reign in and as Christians we too teach the same. Psalm 116:1-9 I love the Lord, because he hath heard my voice and my supplications. Because he hath inclined his ear unto me, therefore will I call upon him as long as I live. The sorrows of death compassed me, and the pains of hell gat hold upon me: I found trouble and sorrow. Then called I upon the name of the Lord; O Lord, I beseech thee, deliver my soul. Gracious is the Lord, and righteous; yea, our God is merciful. The Lord preserveth the simple: I was brought low, and he helped me. Return unto thy rest, O my soul; for the Lord hath dealt bountifully with thee. For thou hast delivered my soul from death, mine eyes from tears, and my feet from falling. 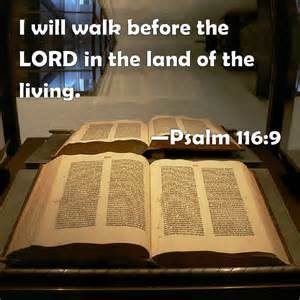 I will walk before the Lord in the land of the living.